TweetiKeyword Free iPhone and iPod Touch Application was released in response to requests from potential users of iKeyword, they wanted to test iKeyword before purchasing. Since coupons were not scalable, free edition was released integrated with iAd. iKeyword is a must have tool for any online marketing expert. It allows you to search for related keywords using the Google AdWords keywords on the go and also forward the keywords found as a CSV via e-mail. In the free edition number of related keywords returned is limited to 5.
iKeyword iPhone/iPod Touch Application is a must have tool for any online marketing expert. It allows you to search for related keywords using the Google AdWords keywords on the go and also forward the keywords found as a CSV via e-mail. 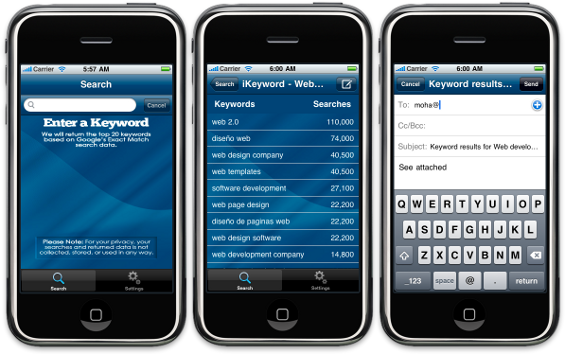 This app can help you discover keywords using your iPhone. Very handy during client meetings and other odd situations when you need to discover related keywords fast, also you can keep those keywords for your reference. © 2010 S.H.Mohanjith. All rights reserved. We are an Authorized SSL Certificate Reseller for DigiCert™, the industry leading provider of SSL Wildcards and Secure Fax services.